SquigglyTwigs Designs: What a Pair! 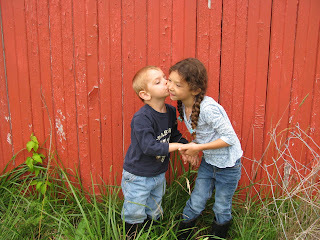 My two kiddos by a barn. Handsome dude says "I'm going to buy this barn and be a farmer boy." The barn is actually with a farm we tried to buy. Some day!!!! Until then we'll pray for this farmer boy wanna be and his sweet sister. BYW the kiss on the cheek/hand holding pose was all there idea. The handholding part was Curly's idea so Handsome dude wouldn't accidently grab the poison ivy beside him. Too sweet on her part. I'm so thankful the Lord has allowed me to be their "Mama".